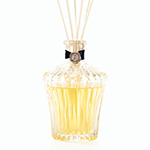 Antica Farmacista's Crystal Luminoso Decanter is the epitome of sparkle and refinement. Filled with a beautiful soft scent, inspired by the purity and freshness of baby. Built on notes of soft peach, sparkling citrus and sheer floral notes of lavender, may rose and bigarade. A powdery hint of white musk, honeyed almond and creamy Tahitian vanilla round out this sweet, calming scent.